Epping, NEW HAMPSHIRE (July 8, 2018) – Sandvik Coromant Mopar Dodge Funny Car driver Matt Hagan completed a wire-to-wire weekend at New England Dragway, racing from the pole in dominant fashion to claim his second consecutive win at the NHRA New England Nationals, and his second win in a row of the season. 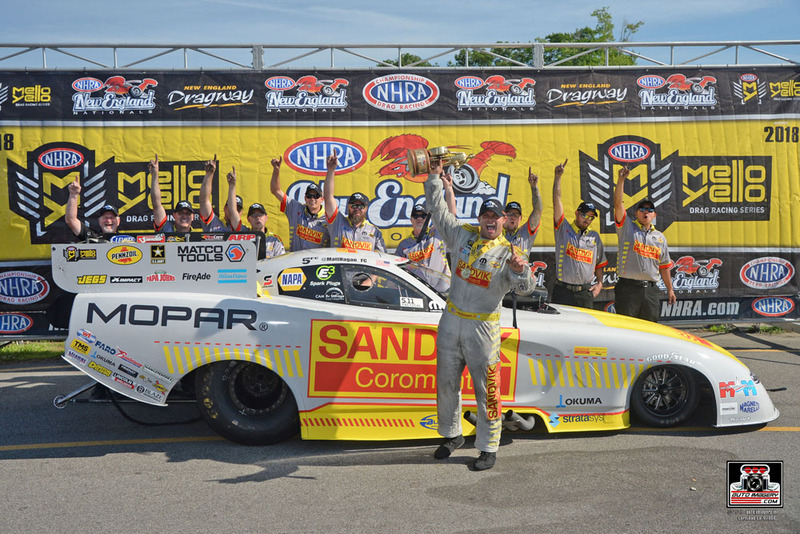 Hagan’s triumphant ride in Epping, New Hampshire, was the third consecutive and fifth of 2018 for a Don Schumacher Racing (DSR) Dodge Funny Car driver, and the seventh of the season for DSR. The win was Hagan’s third of the season and 29th of his career. The Sandvik Coromant Mopar Dodge Charger R/T Funny Car driver and winner at the most recent NHRA stop in Norwalk, Ohio, qualified No. 1 and began his march to the event win by taking out Terry Haddock with a 4.066-second E.T. at 316.15-mph that was the quickest of all competitors in round one. Next, in a battle with teammate Tommy Johnson Jr., Hagan’s 4.237 at 245.90-mph run was more than good enough for the win after Johnson encountered problems early. 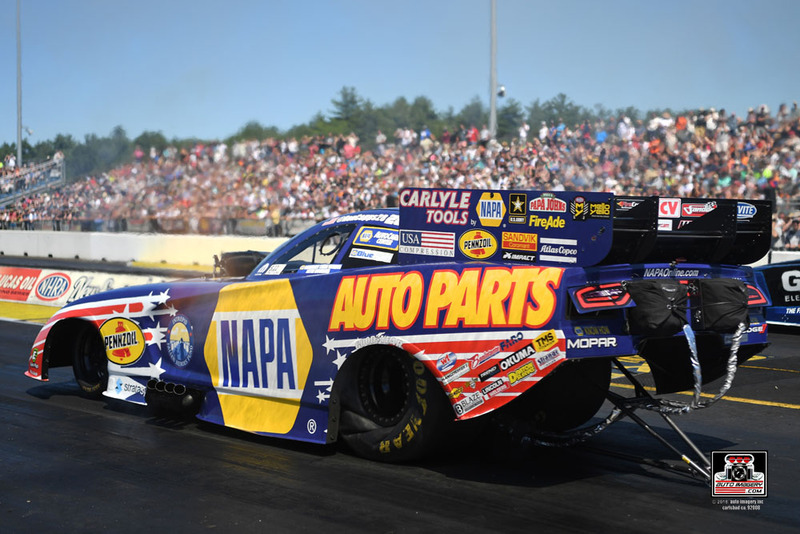 The defending 2017 Epping winner drew a second teammate, Ron Capps, in the semifinals. Hagan was first off the starting line and first to the finish with a 0.062 reaction time paired with a 4.114-sec at 311.05-mph pass to advance to his 52nd final round and fifth of the season. The two-time NHRA Funny Car world champion remained on-point in the final against Tim Wilkerson, recording a superb 0.042 reaction time in the money round and passing the finish line with a winning 4.156 at 292.01. “We've just got a good race car. I think the biggest thing is (crew chief) Dickie Venables," said Hagan, who gained almost 100 points on category leader Courtney Force over the course of the race weekend. "The guy is smart. If you give him enough runs and enough opportunities at whatever it is, he’s going to figure it out. I think that’s why he’s been in the sport for over 50-some years. He’s been doing it since he was hanging on his dad's leg. He’s somebody that I want to keep myself around as long as possible. He works hard, this is his life and it goes to show on the race car. There’s also luck, that last lap it was like a dirt track. My rear-end was sideways and coming back around and I could hear (opponent) Timmy (Wilkerson) over there and you’re looking around to see where they’re at. That’s what makes it exciting in a fuel Funny Car, man. You never know what you’re going to get. I’ve never had the same lap back-to-back. "This car has just been going down the race track. We turned four win lights on in Norwalk and we turned four win lights on here and we went down every lap in Norwalk and we went down every lap in qualifying here. We just pretty much have what you would call a bracket car in a fuel Funny Car. It’s just responding well to what they’re asking it to do. It makes my confidence grow. As a driver, it makes my lights come back around. I’m more focused on that and I’m not thinking about whether the car might come lose or what it’s going to do if I have to slap the tires. I can get up there and tell myself 'leave on time, keep it in the groove, turn the win light on.' You’re focused on what you have to do versus what everything else is going to do. "I’m proud of my guys. They just haven’t had any mistakes. This whole year my crew has really not faltered. They haven’t had any whoops. They’ve been doing a great job wrenching. They’re very thorough on touching the parts and pieces and making sure they’re going together." 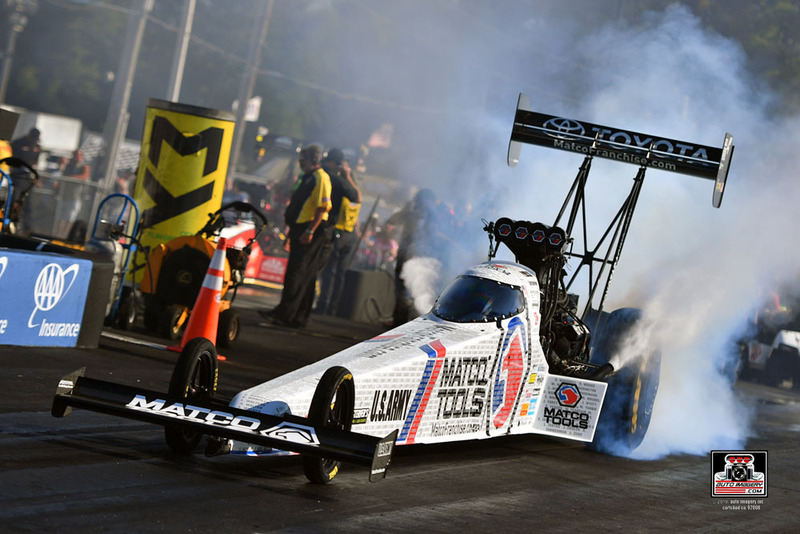 Antron Brown and the Matco Tools/U.S. Army/Toyota team raced to a runner-up finish in Sunday’s New England Nationals before a sell-out crowd. Brown, who won here in 2016 and finished as the Epping runner-up in 2017, began his quest for his first title of 2018 with a round-one matchup against Clay Millican. Brown piloted his Matco Tools machine to a 4.275-second pass, easily defeating Millican’s struggling 6.083 E.T. The quarterfinals were a rematch of last year’s New England Nationals finals, with Brown getting the upper hand over Brittany Force. Brown had a 0.039 advantage at the light and went on to defeat Force 3.923 to 3.935. It was his best pass of the weekend. The semifinal round found Brown facing teammate Leah Pritchett. Once again, Brown had the advantage at the tree 0.055 to 0.071 and then went on to hold-off Pritchett, winning on a holeshot by 0.006 seconds with a 3.955 E.T. to Pritchett’s 3.945. In the finals, Brown matched up with point leader Steve Torrence. The two left almost simultaneously with Brown running a 3.948 E.T., but it wasn’t quite good enough to defeat Torrence’s 3.909. With the runner-up finish, Brown climbed up to sixth in points with five races remaining before the Countdown. “We’re taking it one step at a time and we’re constantly getting better and better. Our car has been running well, we just needed to be in the right spot at the right time. We thought this was our weekend and we’re just bummed (after losing in the final). This entire Matco Tools/U.S. Army/Toyota team has just been working so hard together. We have the Western Swing coming up – Denver’s first and I’m just looking forward to getting back to the race track. Our team is coming together at the right time and by the time Indy comes up we’ll be hitting full swing. That’s our game plan. "We had three good runs to close out the day, but we were trying to make them a little better. We just have to learn our bearings. We were able to pedal the car today in the first round and still go down the race track. We’ve got a lot of things that are positive that we’ll take out of today. We just need to keep focusing on that. We’re getting better and the other teams are seeing it. We just have to keep getting after it. We moved up to sixth today and our focus is just to keep picking away at the gap to fifth. That’s our goal to try to get into the top five. Then we’d like to see if we can move up to fourth before the Countdown. We love going to the Mile High in Denver. It’s always a challenge, but we’ve got the brain trust and the people to run well there." After earning her ninth career No. 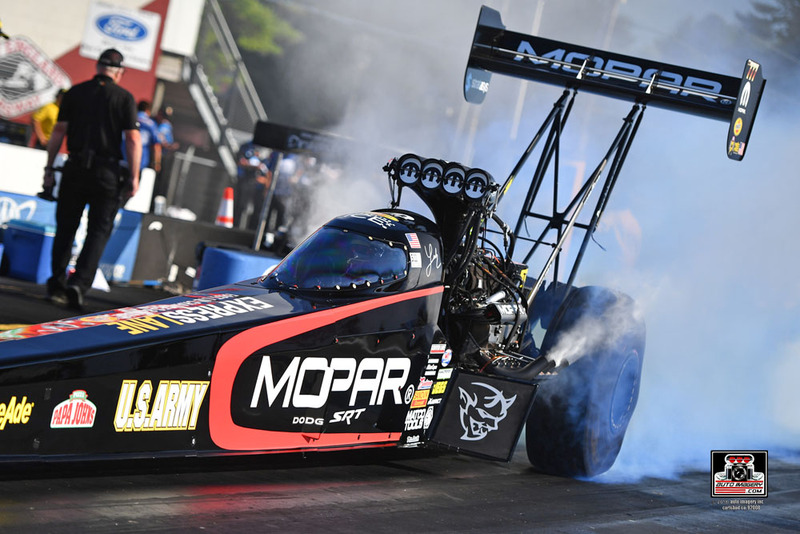 1 qualifier spot, Mopar Dodge Top Fuel driver Leah Pritchett never trailed against No. 16 qualifier Audrey Worm on her way to the round win. Pritchett faced veteran Doug Kalitta in the quarterfinals and motored down the groove to the tune of 3.888-seconds at 316.30-mph, second quickest of the round, to advance to the semis with lane choice over Antron Brown. Pritchett trailed slightly out of the gate but briefly nudged the nose of her Mopar Dodge into the lead before Brown was able to chase down her 3.945 at 304.80-mph pass for a holeshot win. With her run to the semifinals, Pritchett moved up one spot to fourth in the Top Fuel point standings. “Incredible race car underneath me and an incredible team, no doubt. We were adapting every round to the situation, the competition just got more stout, tougher and tougher. I’m proud that we had our three DSR Top Fuel cars in the semifinals. I was feeling it today; the car was doing well. We kept backing the car up. I take the hit – you know, two hundredths late on the (starting) tree and a couple thousandths quicker off a car (against Antron Brown). When it’s that close, that’s when you look for those win lights, and the moment that you see it in the other lane, it’s devastation. But when you do get the first two win lights like we got today, I’m very proud of that and proud for the Mopar team and putting that Mopar power on the ground. 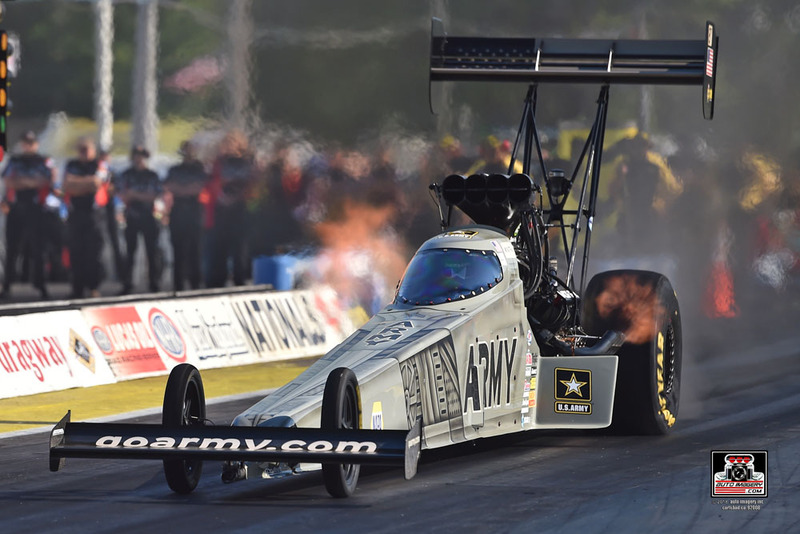 U.S. Army Top Fuel dragster driver Tony Schumacher used a little help from Mopar HEMI power to put down the second-quickest run of the opening round in taking out newcomer Jim Maroney. In round two, “The Sarge,” left first with a 0.070 reaction and led from start to finish against Richie Crampton. Schumacher moved first again in the semifinals with a quicker 0.056 reaction time to Steve Torrence’s slower 0.068, but Torrence soon surged ahead for the round win. Schumacher climbed up one spot in the standings after his weekend at Epping, and now sits second. 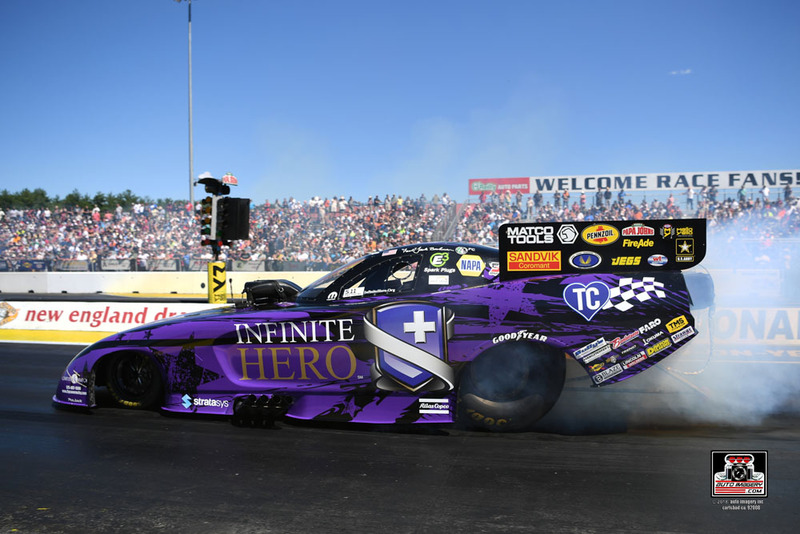 Jack Beckman’s strongest qualifying performance since the NHRA Gainesville event in March placed his Infinite Hero Foundation Dodge Charger R/T Funny Car in the No. 2 position heading into eliminations. The 2012 Funny Car world champion posted the second-quickest run of the opening round to send home Jeff Diehl and join his three DSR Mopar teammates in advancing out of round one. In the quarterfinals, Beckman was within striking distance of Tim Wilkerson but was unable to beat his foe to the finish, falling short by about four feet. He leaves Epping third in the Funny Car standings. Ron Capps may not have triumphed at Epping, but the Mopar-powered NAPA Intrepid Fallen Heroes Fund Dodge Charger R/T driver’s strong weekend jumped him from sixth to fourth in the point standings. 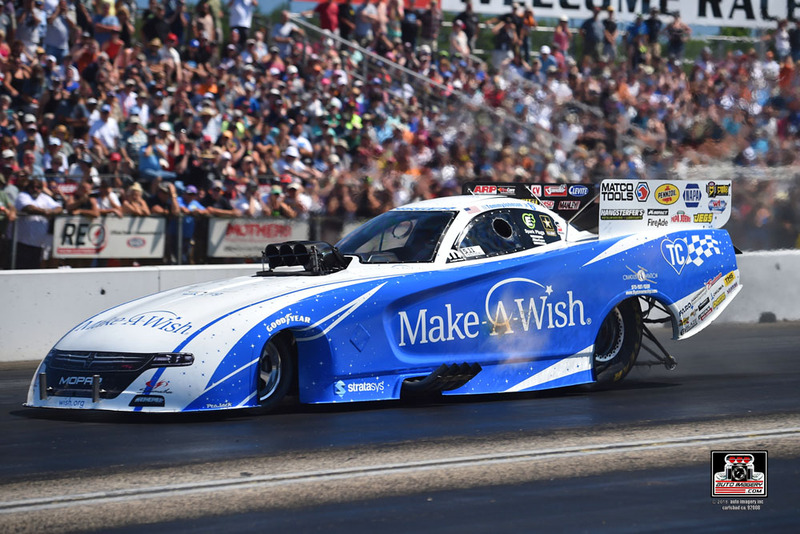 Capps also helped himself and the entire Funny Car field by taking down points leader Courtney Force in the first round with a straight-down-the-track 4.083-second at 306.19-mph pass. Despite seeing the parachutes of his Funny Car pop out early, Capps was still able to send home another John Force Racing driver, Robert Hight, in the quarterfinals. The two-time Epping winner recorded a solid 4.122 at 311.20-mph run in the semifinals but could not stop red-hot teammate and event winner Matt Hagan. “We got the chance to put the NAPA Intrepid Fallen Heroes Dodge in the winner’s circle before, and it felt like we were going to get there this weekend. We certainly had our work cut out for us when we looked at the ladder after Saturday Q4 was over, because our side of the ladder was stacked. We had to go through some of the best cars we’ve seen all season. We got lucky a few of those rounds. These rounds in the summer are important, and we’re making progress in the NAPA car. Make-A-Wish Dodge Charger R/T driver Tommy Johnson Jr., a Funny Car runner-up twice at Epping, qualified in the top half of the field and defeated Cruz Pedregon in round one. Johnson trailed slightly at the start but closed the gap and pulled away for the round win with a 4.131-second at 297.94-mph mark. Johnson’s hopes to advance ended quickly in the quarterfinals against teammate Hagan after he smoked the tires early.